The reason to sealcoat an asphalt driveway on a regular basis is to prevent accelerated wear and tear due to use and weather. Both sunlight, and extremes in heat and cold affect how long asphalt lasts and how it looks.The recommended schedule is every 2 to 3 years. 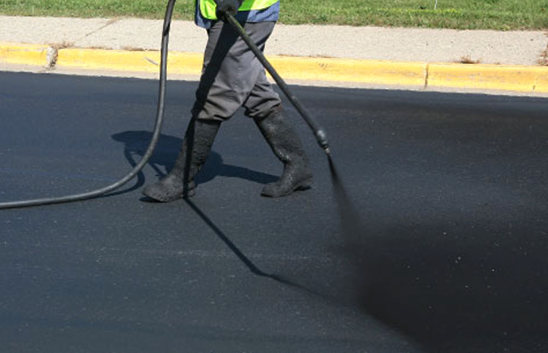 Freshly coated asphalt also needs to have lines and markings painted after proper drying time. Before Parking Lot Services applies sealcoat, we clean the existing asphalt thoroughly and repair the cracks expertly before sealcoating. It’s important to check out the qualifications and standards of a company before you hire them for asphalt maintenance and repair. It’s important that you spend your maintenance budget with an experienced company like Parking Lot Services that is fully equipped and insured, staffed by experienced people, and follows clear and strict quality standards. Parking Lot Services begins each estimate with a thorough inspection. You’ll know exactly what we recommend and why. We will set and hold to a clear schedule because we know this is important to you. We realize you have schedules to keep and that’s why we plan around our clients’ schedules. Parking Lot Services is committed to your satisfaction. Call now to schedule an expert evaluation and estimate.